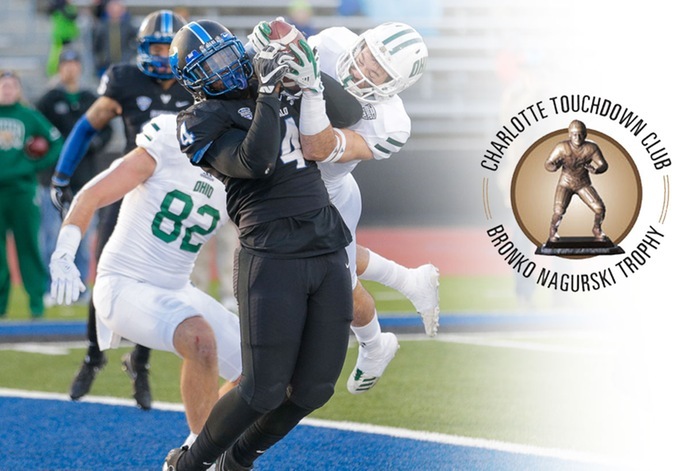 BUFFALO, N.Y. -- University at Buffalo senior linebacker Khalil Hodge picked up his third preseason accolade on Tuesday as the senior linebacker was named to the watch list for the Bronko Nagurski Award. Presented by the Charlotte Touchdown Club and the Football Writers Association of America, the award is given annually to the best defensive player in college football. The Bulls' 2017 first-team All-MAC selection has also been named to the preseason watch lists for the Bednarik Award and Butkis Award. Hodge is one of four players from the Mid-American Conference on the list. The Stockton, CA native is just the second player in school history to earn the honor, joining former All-American Khalil Mack. Hodge is entering his third season with the Bulls after earning All-MAC honors over his first two. He totaled more tackles (277) than any other player in the nation over the last two seasons. In 2017, he racked up a MAC-best 154 stops, the most ever by a UB player in its FBS era. He ranked second in the nation in tackles in 2017. The award is named for Bronko Nagurski, who played football for the University at Minnesota and the Chicago Bears.